Spectacular ocean side home in a private community with your own private beach! This unique beach home is an exclusive, one of a kind custom villa, set on a magnificent private cove. This romantic home is perfect for your honeymoon, your wedding, or special birthday weekend. It is very luxurious and has high end furnishings and decor. Located in exclusive South Beach, La Perla Del Mar is just minutes from the rustic shopping areas and one-of-a-kind restaurants of downtown. Close to the San Felipe International Airport. Located to the south of San Felipe at Kilometer #6 on Puertocitos Highway. Relax and enjoy your own private beach! Life doesn't get any better than this! There is a 24 hour security guard on the property. Features include granite counter tops and venetian plaster! The floors are travertine throughout. There are three full bedrooms and three and one-half baths. There is a new Whirlpool Duet front loader washer and dryer. This fine California style beach home boasts approximately 3500 square feet of living inside, another 3500 square feet of covered deck living, and another 3500 feet of tiled and walled private pool area living. Yes, you may take a private swim in your very own pool, including an outdoor shower. There are panoramic views from the upstairs master bedroom, which includes a master retreat, complete with three separate decks off every door, and also hosts a distinct and modern living area. All modern appliances including reverse osmosis drinking water filtration in kitchen and master bath. Continuing to the next level, there is a roof terrace which is tiled and is perfect for viewing the ocean, or the absolute incredible stars at night. The two car garage can hold your toys, or safeguard your valuable automobile. The garage is also tiled. The beach is ideal for windsurfing, paddle boarding, or launching your sailboat or jet skis. In addition there are great opportunities to ride your dune buggy, jeep, quads, UTV's, RZR or all terrain vehicles in this area. There is sand, beach, hills and many trails to explore. Every day is an adventure! If you desire you can swim, snorkel, or scuba dive right out from the house! The front entry has another covered patio which allows you to sit and watch the ocean roll in, as you sip the beverage of your choice. Perla del Mar has the nicest private beach in San Felipe. It is perfect for beach combing, long romantic walks, and listening to the waves roll in. Michele and Bob are passionate about owning unique properties, and Michele is terrific at furnishing our properties in a unique and attractive style. Our properties have our own signature touch and we spend many hours making sure that they measure up to our high standards. The south end of San Felipe has many high end properties. This unique beach, Perla Del Mar, has private soft sand beaches. It has it's own hot springs. It is an ideal location for young children. It is very secure, private, and an incredible home right on the water! It is important to feel safe! La Perla Del Mar has 24 hour security guard service. This is a private community with four houses currently. It is a very private beach and is off the main road about one half mile. There is absolutely no road noise, only the sound of the gentle waves! You are right on the sandy beach when you step out the front door! The kids can play in the front yard which is beach sand, while you sip a margarita and enjoy the view. Private secluded cove and nice soft sandy beach directly in front of property. This home is located right on the beach, with spectacular views for as far as the eye can see. This site is perfect for any beach activity that you can imagine. Beach combing, and romantic strolls. Great place to ride your ATV, UTV as there are miles upon miles of beach front. Five zone A/C units to keep you cool where you need to be cool. A/C units also have heat. Whirlpool front loader electric dryer. Bring all your toys. Plenty of parking for all your friends and family. Water and ice in door. Side by side refrigerator. Gas stove top for chef cooking. Four burner stove with griddle in center, with full oven, all are gas. Two slice Black and Decker. Blender, knives, complete silverware, dishes, and service for eight. Full service with Corel china. Reverse osmosis drinking fountain next to the kitchen faucet. We have a private well and the water is perfect for all your needs. There is also a trash compactor. Multiple cabinets, loaded pantry. Bar in kitchen will seat two. Dining table will seat six. Flat screen HD LG TV in great room. Directv cable with HBO and Cinemax, including the local stations for San Diego. The Direct TV has multiple music options. Multiple tiled balconies off multiple rooms as well as complete full tiled deck on top floor. Nice private pool in rear of house with high walls for total privacy. Completely tiled area around the pool. Outside shower! This place was outstanding it was a short stay but my family and I enjoy it a lot, everything was picture perfect . We were able to enjoy the beach, yes all the beach for ourselves and then come back and relax at the pool while we eat a delicious bbq. We had a fantastic time! We spent a glorious Thanksgiving week hanging out and exploring the beach. This house was perfect for 5 adults and 3 kids. The nice furnished kitchen was a plus since we did a mixture of going to town and eating in. Thank you so very much for taking time to write a review for my home. I am so happy that you enjoyed your Thanksgiving at the beach. I hope that you will come back very soon. This place has everything you want for privacy and comfort. We will be back. Thanks again Michelle. This house is absolutely beautiful, beyond what pictures can depict. The views are amazing from so many parts of the house. Beyond that, it is perfectly located, close to town but far enough away that the water is clean and beautiful, and the location feels remote and private. (It is also a close drive to one of our favorite restaurants/bars on the South beach - Percebu). We went for a long beach walk and so no one! Great swimming beach too. The house has many upgrades/beautiful features, such as beautiful tile, woodwork, fantastic showers, air conditioners - plus the beautiful, tiled swimming pool and patio. The kitchen is very well equipped and even had a dishwasher! We owned a house South of town for years, and I can say that these kinds of upgrades are not typical/ubiquitous for all houses in San Felipe. The house was also absolutely spotless - top to bottom - when we arrived. Great communication with the owner, and the caretaker was very helpful and friendly. 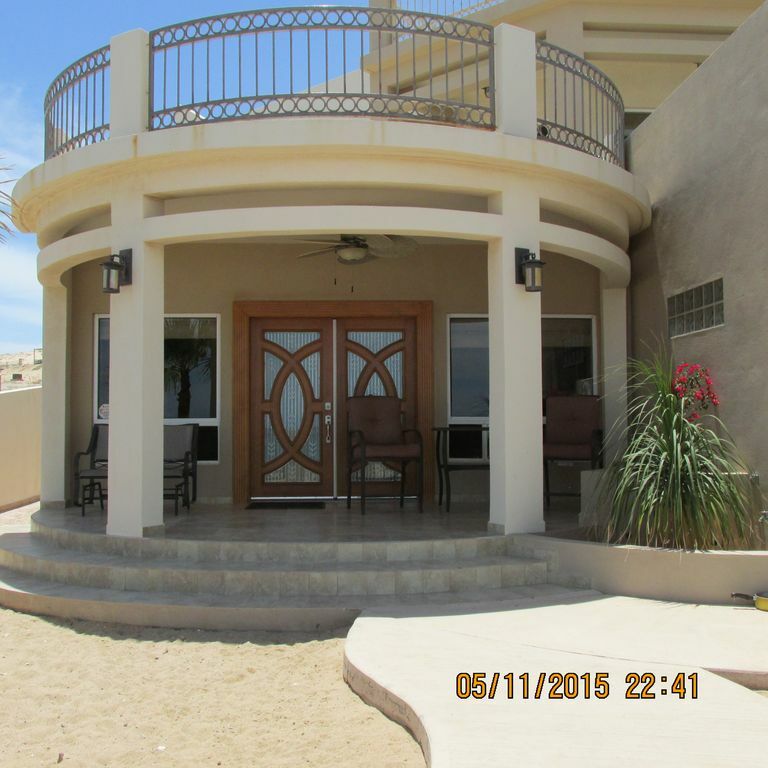 I highly recommend this house if you are interested in a San Felipe beach trip. We are already planning our next visit! Thank you so much for the stunning review. I am so glad that you found everything to your liking. We try very hard to give our guests the very best experience possible. We realize that you have many options and we are honored to have been chosen for your vacation needs. I am looking forward to your return in April. Return guests are the BEST! Beautiful home and property in a most relaxing setting on the sea. Michelle was very responsive and gave us a lot of great information before we arrived so it was already welcoming and a comfortable feeling. The home was everything it stated and very wonderful. Joey, the onsite helper was very friendly and resourceful. We are already thinking of a return trip with more family! Thank you for spending a week in paradise. I am so glad that you enjoyed the house and the beautiful and peaceful surroundings. I love how it makes my soul feel when I am there. Please come back very soon. You will be more than welcome. Thanks again. Perla Del Mar is ten miles south from downtown and the Malecon, which is the boardwalk. Close to restaurants, shopping, bars, and ATV rentals. Great little community! This lovely beach villa is at kilometer 6, located 7/10 (seven tenths) off the highway on the way to Puertocitos or South from the town of San Felipe. The entrance is clearly marked and easy to find. It is called La Perla Del Mar! The road to the villa is 2/10ths of a mile after highway marker six, and to the left. The beaches to the south of town are soft beautiful sand for as far as the eye can see. We highly recommend that you visit 'land of the giants' which are ancient huge cactus. This is a little further south on the highway to Puertocitos. Absolutely no smoking in this villa. Those doing so will forfeit their security deposit. Check in time is 4pm, check out time is 11am, unless prior arrangements have been made.